Discussion in 'Civ4 - Unofficial Patches' started by Dresden, Nov 3, 2008. This is a modification of the core DLL for the game Civiliztion 4: Beyond the Sword. It is a community effort to add fixes and improvements beyond the latest Official patch release with intent to fix obvious bugs but not drastically alter gameplay. This is an update to the Unofficial Patch originally created by Solver. This version was developed by Dresden with help from other CFC members. the official 3.17 release. All changes should be documented in the code. provided by Refar with his Visual Studio debugging setup instructions. Fixed rare bug where Info screen Score graph would break if using debug mode and viewing an unmet AI. Fixed bug with CyUnit::getRevoltProtection() returning the wrong value. Spies really no longer interrupt their mission when moving next to an enemy unit. Modified AI civic valuation to more accurately consider state religion preference. Certain situations which invalidated Secretary General/AP Resident will now force the next vote to be an election. Limited which production modifiers affect gold from production overflow. Building or removing a fort will now force a plotgroup update to verify resource connections. Obsolete resources no longer considered worthless in trade; their value is now controlled by the BONUS_OBSOLETE_VALUE_MODIFIER Global Define. In the supplied GlobalDefines.xml, this is 150 meaning a 50% markup; 100 would be the same value as before obsolete, 0 would mean worthless. Conquistadors now ignore city walls just like the Cuirassiers which they replace. Tweaked plane retreat logic to avoid unnecessary mission check. Added jdog5000's AIAutoPlay changes (SDK only) to help with testing. Added global context functions isUnofficialPatch() and getUnofficialPatchVersion() which are exposed to Python. Added (English-only) patch version string to flag hover text. Idea borrowed from BetterAI mod. Fixed bug where AI misinterprets the civicPercentAnger attribute when evaluating trade deals. AI will change religion during Golden Ages. Access to the Barrage line removed from armored units. If units with access to Barrage and no inherent collateral damage are modded in, they will work. Fixed AI defender bug for newly captured cities. ** Fixed overproduction of transports in land wars courtesy of better BtS AI team. Made the AI more likely to use missiles on cruisers/subs to strike against enemy improvements. Made AI ships prioritize retreating if docked in a city which is in the danger of imminent capture by enemy. Somewhat experimental AI change: Aggressive AI now considerably less likely to want peace if it poses more of an immediate threat to enemy cities than it currently faces itself. Fixed unavailability of foreign civ demographics if playing with espionage disabled. Special thanks to DanF5771 for investigating, code suggestions, and testing. Also thanks to ViterboKnight, jdog5000, ruff_hi, and EmperorFool for providing fixes and the many other community members who reported bugs and/or provided saves demonstrating problems. Issues which have been fixed in the current development version and will be included in the next release. Fixed problem regarding lightly-damaged AI planes always choosing not to attack. [jdog5000] See jdog's post below. Groups on sentry now awake based on farthest-seeing unit's vision rather than head unit's vision. [Pep] See Pep's Bug Report. Hidden Nationality units can now enter friendly rival territory (without open borders) when starting move in a city. [Pep] This is Pep's Privateer fix. Issues which are being actively worked on in the current development version and are planned to be included in the next release. Issues which are up for discussion and on which no decisions have been made. Tech value issue on dogpile war trades. Problems where civs go into perpetual WHEEORN because they can't find a route to their target and refuse to use boats. An example is Gliese's Deity game. The Liberalism cheat where you can get the free tech to apply to a different game. Listed here because I'm not yet sure it can be fixed in the SDK. Possible change so that if you tell a unit to goto a plot in the fog or black it won't automatically attack if it finds a previously-unseen enemy when it gets there; also a similar change for transport auto-unload on a plot in the black. Both are part of Pep's New sentry actions for units modcomp. Fixing some of the worst No Espionage problems such as EP-granting events, the Communism Free GSpy, and espionage buildings that serve no other purpose. See discussion below beginning with r_rolo1's request. Privateers can see invisible/stealth units. See jdog5000's post below. 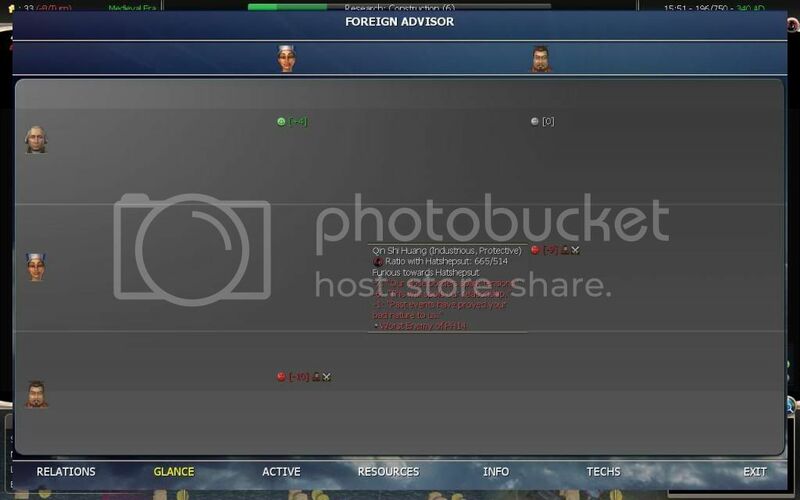 Colonies which replace eliminated players still display the old civ's name and leadername in some places (like the scoreboard) because those names are stored outside the SDK and the API doesn't provide a way to change them; should be able to be worked around via methods the Revolution mod uses. Save from GravityWave. Issues which either can not or will not be addressed in the next release. Thanks for picking up the reins on this! Just a quick note that grumbler's Installer has been updated to this version and links added to the first post. A 50-civ version of the DLL will be posted soon too. Also my apologies to DanF5771 for screwing up his username in the readme. I always want to put 5571 instead. hakuna matata, Drösdön . What's in a name? Thanks for pushing Civ-things forward in such a professional way ! Dresden, this sounds great. I am currently working on a mod, and I am trying to get to ~20-22 players. Most of the mod (and WBS file) is done. I attempted to bring in your patch by including it in the mod, but that didn't seem to work. My question is, if I install your new patch into the main Civ IV directory, is this going to have any adverse effects on my mod (kill the ability for it to load, etc...). Or, what would you recommend? I think I am going to have to go into the WBS file and alter some of the team/player data anyways, but might I need to go into other portions of the pre-existing files? I am NOT a computer code person by ANY stretch of the term. I am good at cutting, pasting, trial and error, and finding lines of code that seem to contain that which I am interested in. First, if your mod/scenario uses more than 18 players then you want to use the 50-civ version as a base. I'm not completely sure of the effects of installing that as the main DLL as it was made on request and I play with the "standard" 18 civ-max myself. However, you think that having the 50 player DLL within the mod, while having the game patched to the official 3.17 version... should work? Could the new DLL conflict at all with the already existing WBS file? The DLL change in and of itself should not cause you any problems. Is there a way to know that I have downloaded the patch successfully? Sometimes when I download these patches I don't know if I actually do have them. To make sure the patch is active, load/start a game and hover your mouse over the flag on the main interface. If you see the BTS and Patch version numbers above your leader info, then it is running. I appreciate the efforts made to update this unofficial patch, well done. Noting that the Better AI is now at version 0.41 are there similarities between that and this patch..? I am eagerly waiting for Ninja2 to complete his fabulous work in merging this patch along with Better AI, Wofshanzes, and others, in his latest release but I do not have the skills to merge Better AI with the Unofficial patch. So does the unofficial patch and the Better AI share some game fixes and perhaps the latter attempting to improve the AI gameplay..? well, I am getting problems. After changing the dll, I have tried to go into the WBS file (increasing the number of players/teams...) and I often get the "you are defeated" screen. I can see improvements remaining on the map, but the cities (and most units) are no longer there. Some civs still have a random start unit (or two), but the established positions have all been nuked. In his post announcing Better AI 0.41, jdog5000 mentions that 0.41 includes the changes made by Dresden in his unofficial patch. That would mean that if you use Better AI 0.41, you don't need to merge Better AI and the unofficial patch. Oh, and many thanks for the patch, Dresden!! That is great work and I waited eagerly for your patch before I updated to 3.17. So simply changing from the original 3.17 DLL to the Unofficial Patch DLL results in these oddities? And is there any difference between using the standard Unofficial Patch DLL & the 50-civ one? I don't know much about the WBS-editing area of modding but perhaps there is an issue because of the increased number of players. I agree that it is likely a result of the changed number of players... but I am really not sure what needs to be changed. I have not yet tried the standard unofficial patch. If anyone else out there has any ideas, please feel free to post. Dresden, Although we can't figure it out (quickly), thanks for your effort. I'm just gonna push forward with what I have (with the 18 player version). Quick question though: if there's an installer, why not incorporate it into the patch DL? There is a choice. You can either download grumbler's installer or the zip version depending on your preference. You only need one of them. Thanks r_rolo1; both for the report and the save. I've heard of that but hadn't seen it recently; hopefully it's just a simple isHuman() check that needs to be added. I guess the vacation's already over and it's time to start the to-do list for 0.23.